The revolutionary THAYA inflatable kayak, using a combination of our unique Nitrilon® material and the Dropstitch* technology, is characterized by excellent stability, stiffness, and maneuverability. 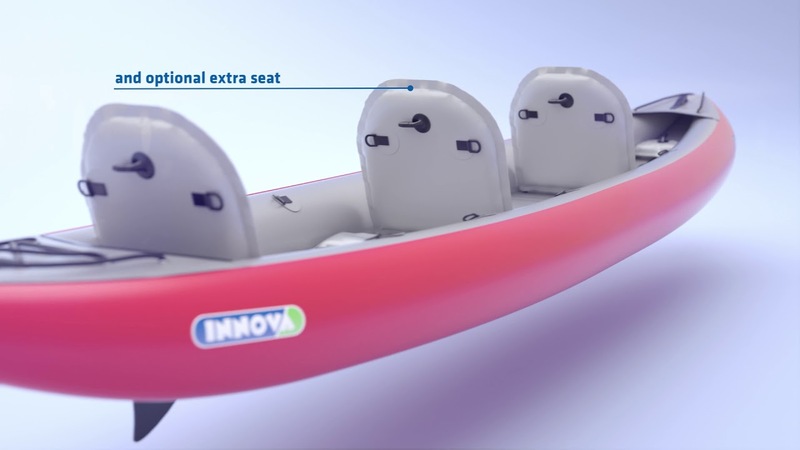 The unique combination of inflatable cylinders and modern Dropstich* technology create a universal experience that maximizes the user’s comfort and improves the handling properties of the boat. Other properties of the THAYA kayak include a low weight and excellent durability. It is suitable for paddling lakes and rivers up to class II. Seating can be arranged for 1 or 2 adults, or 2 adults + 1 child by adding an additional seat (sold separately). Included is a skeg/tracking fin to keep the kayak on a straight course. *Our patented Dropstitch technology is based on the connection of the upper and lower layers of fabric with thousands of polyester fibers. This fabric, equipped with an airtight deposit, is protected on both sides by a resistant Nitrilon® material. Thanks to the thousands of fibers holding the layers together, these products can be inflated to a very high pressure. It enables the material to obtain robustness approaching the robustness of solid materials, and that is with the preservation of the same durability as our existing boats.